Our effective staff, efficient building design, and proper office policies are intended to help us reach our goals of providing excellent dental care at minimal fees. Excellent dental care does require a financial commitment on your part, as the cost of dentistry does include such items as meticulous equipment sterilization, quality dental lab work, modern professional equipment, supplies and all the other components that make for a quality and effective environment for your care. Payment for professional services is required at the time of service, unless prior financial arrangements have been arranged and agreed to. For your convenience, in addition to cash and checks, we do accept MasterCard, Visa, Discover, American Express, CareCredit, ARKids First and Arkansas Medicaid. In those situations where a complex treatment plan exists, requiring many visits, fees and financial options become more flexible, and will be discussed in detail with you before treatment initiates. If you meet credit requirements, we can arrange for you to pay off your dental care with multiple payments through CareCredit. If you want to get your dental treatment now, and pay it off over time, click the CareCredit Apply Now button on this page. Fees for all treatments are based on many factors, including the time required to perform the needed treatment, the expense of materials involved, and the expertise Dr. Carroll must possess to perform your necessary treatment. Please feel free to inquire about specific fees at any time. All records we create, including x-rays, used in the diagnosis and treatment of our patients, are the property of our office. The fees you pay are for our time spent in your treatment, and for the expertise used in diagnosing and treating dental conditions. 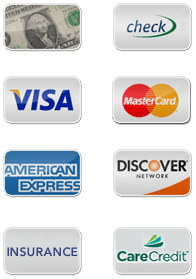 Payments you make are for complete dental services, not specific products. We are happy to transfer copies of our records to other health professionals as needed, but original records must remain with us.